Of potholes and politics | Notes from the U.K. This entry was posted in Politics and tagged British local politics, local politics, potholes, rubber ducks, Steeple Aston potholes by Ellen Hawley. Bookmark the permalink. I’m glad, because the topics are really only a structure to hang digressions from. It does indeed. We have two dogs. Need I say more? If we could get the duck past the -ling stage, I think it’d be okay. It all makes perfect sense to me… but then I am British, but so funny too. Loved this post. I just love a creative–not to say insane–protest, and I really admire the minds behind this one. It really did make me smile. It’s always funny to see how other people see us. A refreshing post, thanks. Even if it is the Most Moderately British protest ever, I still don’t know what the world’s coming to. Really, I just don’t. Ooh, that cheered me up. Well we does aim to please, yknow. I must admit I’ve never seen a rubber duck race, although I believe they are quite similar to playing Pooh Sticks. (I just had to explain that reference to my husband before he thought my childhood utterly deprived or depraved). I adore the idea of Wild Thing showing up to one with a real duck, but have to admit to some curiosity as to how one trains a duck to race? Oops, my reply got lost somehow. Let’s start over. It took me a while, after I moved here, to figure out–well, not what Pooh sticks was but that it’s a recognized thing here. Your husband’s not the only American who has no idea what you’re talking about. And now I’ll go look for the rest of my reply, which had to do with training a duck. I probably attached it to someone else’s comment, so I’m now exploring irrelevant replies. Okay–the comment disappeared somewhere. Let’s try again. 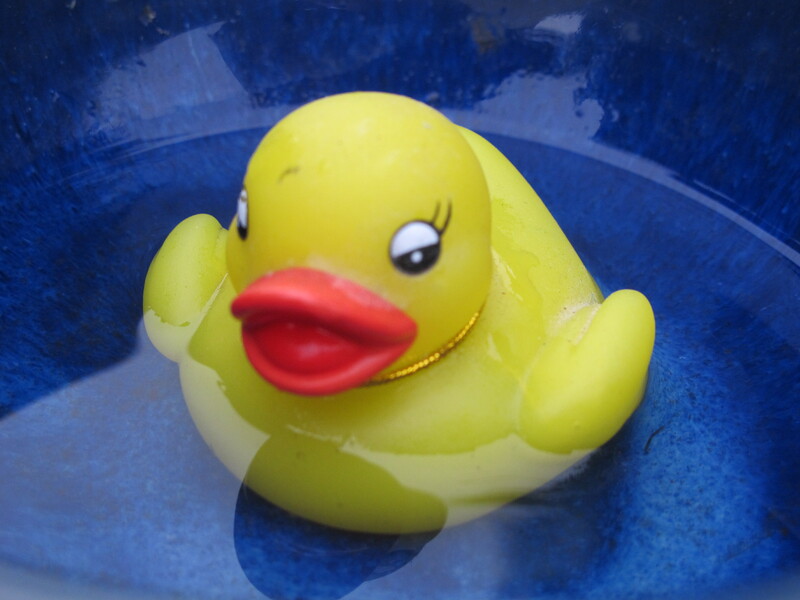 I have no idea how you train a duck to race–and neither does Wild Thing. As long as we keep this all in the threatening-to-do-it stage, we don’t need to know. A.A. Milne has a lot to answer for! There is no idea so charming that it can’t all go wrong when it gets loose in the world. A picnic? That’s the way to go. I might copy the Oxfordshire crowd as the potholes on the Isle of Wight are worse than in Crete. Riding my mobility scooter up to the village and down again is taking my life in my hands, which are not good at the best of times. The scooter’s a sturdy thing but there are times when I think it’s going to fall onto its side. I’m shaken and bruised rather than stirred. Ah, the joys of life! Which leads me to ask, how come they never show us James Bond when he gets around to needing a mobility scooter–which given the way he carries on would be sooner rather than later. But no, he just keeps getting younger. Or maybe he’s staying the same age and I’m getting older. That could be possible, couldn’t it? Anyway, I’m a big fan of political protest with humor, so if you do the picnic, let us all know about it, would you? I sure will. I suspect it’s just us getting older. I’m sure you know the British joke about knowing just how old you are when the policemen keep looking younger. They look like babies to me. …not to mention the doctors, which is truly unnerving. Talking of both, I can’t remember if we’re friends on Facebook but I’ve just made my profile and header the photos I took of ducks at the pond within the grounds of the local hospital! We’re not, and although I seem to have found First Night Design I haven’t found anything friendable. Want to see if you can do any better? Social media isn’t one of my natural gifts. I’m still trying to figure out what are. I’ve found you and sent friend request. We have duck races as fundraisers in America too! I’ve even seen to one 😂 it was rather bizarre, but hilarious. Great post, by the way! Thanks. In the 59 years I lived in the U.S., I never heard of a duck race. Maybe I was hanging out in the wrong parts of the country. Sorry about not correcting the typo. I did when I first started blogging–I was an editor before I retired and it was hard not to–but it took up a lot of time and I decided to devote it to my replies instead, which is a hell of a lot more fun. Instead of expanding my vocabulary, moving here seems to have diminished it. Where I should have two word for somethings, I have this whirlpool of possibilities, none of which is (most of the time) quite right. Or maybe that’s age, not my semi-bilinguality. Thanks for the comment over at my space. WordPress has sent me into a bit of a pothole for now. I can’t seem to scatter “likes” as I visit, but I like your posts anyway! :D But I think I can still make you show up in my “Posts I like” column from the iPad (where I avoid typing anything with the silly keypad). Oh WordPress! you couldn’t have picked a worse time to do this to me!!! I’m glad to know you’re still out there. I don’t require Likes, although I do like them. You understand that you’re playing to my weakness. Or obsession. (Collector of rubber duckies here). Now I have to think of a way to launch a rubber ducky demo. there are innumerable water issues here needing & getting resistance. But I can’t give up my collection so I’ll have to buy a raft of duckies and float them on some body of water imperiled. How to make an impact on Lake Superior? For this to work, I think you’ll have to start with a smaller body of water. Maybe the fountain in front of–oops, that was the old Minneapolis downtown library, wasn’t it? I don’t know if the new one has a fountain. And I have no idea what you’d be protesting. Maybe the lack of a fountain? Would that work? A carton of ducks on dry pavement? Mention potholes to anyone in England (and probably the rest of the UK) and they’ll happily tell you that their town/village has the worst potholes anywhere and that the council never does anything about it. If they do do anything they used cheap and shoddy materials and the potholes are back when winter comes. I won’t do that. I’ll just say that fete is pronounced fate because it came to us from the French, and your back yard is a garden, but you know that. Minnesota (thinks it) has the worst potholes in the world because its freeze-thaw cycle digs deep into every paved surface. The Minneapolis paper once ran a contest where people nominated the worst pothole. The winners, I think, were judged not on how bad the actual pothole was but on how good the nomination was. One of the winners, and my favorite, said the pothole she nominated was so deep she went into labor when she hit it. And she wasn’t pregnant. I thought fete was pronounced fett in French. In fact, I think it is. So I always assumed the British pronounce it fate just to mess with the French. We have a reputation of being bad at languages to maintain. I love the pothole nomination. I hit one on a back road to Winchester once at speed. If I hadn’t hit it quite fast, I think I would still be trying to get out of it. I think one of the reasons potholes annoy us is that we don’t really have a climate that should produce them to the extent that it seems to. My wild and irresponsible guess would be that it’s all the water that does it. Around here, the roads are part of the drainage system, and water’s a quietly powerful force. But going back to the pronunciation of fete: reputation maintained. Who was it started the ‘not’ trend (that’s probably gone out of favour now)? Wayne’s World? Local councils are the pits in themselves… that’s probably why they don’t do anything about potholes (we have an equally useless council where I live) – they ARE potholes. Y’know, I just assumed they’re made of plastic. So I just came back from checking, and according the Great Google, they can be made of plastic or rubber. So you can be half shocked and I can be half wrong. Not to mention half right. I hate to defend local councils, but given the budget cuts they’re dealing with, it’s amazing they’re doing anything at all anymore. So count that as a kind of half defense–right up there with being half wrong on the rubber ducks. Here the local council decided to stop recycling plastic bags, including freezer bags and plastic wrap, so I am rather down on our local one…. Right. We’ll just let ’em blow around till they end up in the sea and 10/20/30 years from now wonder why people were stupid enough to do that. Would love to be present when Wild Thing enters her duck in the race! I wouldn’t hold your breath waiting for that to happen, but I promise you the full tale if it ever does. First, though, we need a duck. The annual village shindig where I last lived in England…flower show, dog show, produce stall, races for the kids…used to be known as the Fete Worse Than Death. Appropriately for the organisers who would have needed to win all the booze on the bottle stall to aid their recovery. When I was a Rural District Councillor …in the days when Rural District Councils existed… potholes would be brought to the attention of the roadman who would then be allotted a load of what was known as hoggin from the council stores. He would then encourage those affected to use it to fill up the hole. There is a South African politician who built his career on potholes. If you had a pothole, you went to see his mother and for a certain consideration the pothole would be filled in…he was thus originally known as Pothole Malema. These days he and his party members elected to the national legislature wear boiler suits to the chamber and are regularly thrown out for doing so. Potholes in Costa Rica are marked by putting branches in them…large or small according to size of pothole. Eventually they will be filled in by which time other holes and branches will have appeared but, not being on the official list, will not be filled in at the same time..
There’s more to this pothole business than I knew. Much more. I love that Fete Worse Than Death. We may have to steal it. If you guys don’t mind check out my last post. Interested to hear what people think! Thanks! Hey, Luke, I see yours is a new blog, so forgive me if I offer some advice: 1) You won’t find out what people think if you don’t set your blog up to allow comments. Or even a Like button. 2) Randomly saying “check out my blog” on someone else’s blog (unless they’re hosting a link exchange of some sort) isn’t a great way to promote your blog. I apologize for my ignorance! I appreciate your connection though. How would I go about setting that up? Thank you! I’m not the best person to advise you, but if you’re using WordPress you’ll find what you need somewhere in Settings, which is itself in the Admin section. Try Discussion and I think it’ll let you set the blog up for comments. I can’t remember where the Like button is, but it would be worth working your way through all the Admin headings and see what you find there. If you need help (and again if you’re using WP) you might want to try its forum and its tutorials. I’ve heard of rubber duck races, just never seen one XD And maybe if the potholes don’t get filled in time you could even sail some paper boats on it. Maybe even decorating your own favourite pothole, who knows. Paper boats sound good to me. I’m not enough of an artist to go in for decorating them. There is little that riles us more than a pothole. I’m trying to think of something that would but you’re right. Not even the weather tops potholes. Without our atrocious weather, we wouldn’t have anything to talk about! Or sort of truly. After 40 years in Minnesota–I try to keep this to myself but sometimes it slips out–I think your weather’s wonderful. I like the variety. The good thing about Britain is that is you don’t like the weather, don’t worry – it will change any minute! Yes–and it’s not likely to kill you. In Minnesota, you couldn’t take that for granted. Doesn’t a road sound more romantic when you call it a carriageway? And the danger of cars running over the ducks is, surely, one argument for rubber ducks as opposed to real ones. Great humor! Your digressions open a new door. Marvelous. Thanks. Digressions are one of my (many) bad writing habits, but I seem to have found a way to make them work with me instead of against–at least in this format. That’s amazing. Thanks for the link. you are welcome. :) I’m glad you like it Ellen. Pingback: Filling potholes, Chicago style | Notes from the U.K.
People are dying and you’re talking about potholes. Believe me, friend, I know it, and outside of this blog I’m a political activist and do what I can–which is never enough. The blog’s a bit of light entertainment, with the occasional serious thread running through. We need to keep ourselves sane if we’re going to be any use to anyone else. Sanity is fighting hordes of demons alone when no one else will. I’m in it for the long haul. That means finding time to laugh, especially at absurdity. It means remembering that life has its joys as well its horrors. If that’s not for you, that’s fine. Okay, it’s a little more blood thirsty than what I had in mind, but if we’re both laughing–and at least at some of the same people–we’ve found some common ground. I used to be a pacifist. Then I was kidnapped by the government, tortured, and caged for months without ever being found guilty of anything. Then it happened again. And again. A few more times after that, I figured enough was enough. Sorry, I’m not sure what happened or how deep we want to get into this. I do hear your pain. American cops stop people for no apparent reason and if people show any sign of standing up for their rights the cops sometimes make bogus charges like “resisting” (resisting unlawful orders, resisting slavery) or “interfering” (being in public around an officer who is commiting a crime), but when being tortured/interrogated, I picked up on a few clues that they had been surveilling me (#PardonSnowden), so many of these stops are not as random as they appear and often coincide with being censored. It’s actually very common, but it doesn’t get much press, because many victims are not all that intelligent. I got a few really bad cases of it, because I’m free press and piss off genocidal billionaires all day every day. …but I’m interesting, occasionally funny, and my concerns are undeniably justifiable, so they let me live. Well, when the banks were collapsing, I was part of a small group that brought cake to local banks because the tellers hadn’t gotten multi-million-pound bonuses. It was a lot of fun, it was great theater, but unfortunately the banks were in such a panic about demonstrators that they decided we were trying to poison them and threw the cake out.